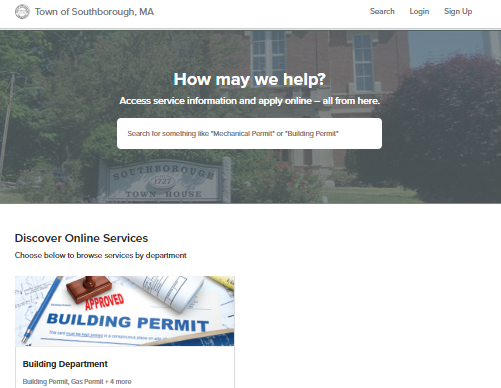 The Town of Southborough announced a new online system for processing permits. According to the announcement, contractors and residents will now be able to apply and track application progress online. This application is used for new construction, renovations, alterations, partial and interior demolition and major repairs to existing buildings including commercial, and one and two family buildings. This permit is required when natural gas/propane gas piping is installed, altered, added to or repaired, including the installation of gas fired appliances. You must be a licensed professional to apply for this permit. This permit is required when installing any electrical wiring, electrical appliances, electrical services, etc. Also includes low voltage wiring including cable TV, internet, phones, security alarm systems, etc. You must be a licensed professional to apply for this permit. This permit is required anytime the building’s plumbing is being installed, altered, removed, replaced or repaired. You must be a licensed professional to apply for this permit. This permit is required to erect, install, enlarge, alter, do major repairs, remove, convert or replace a mechanical system. The property owner or owner’s agent can apply for this permit. This permit is issued by the Building Inspector. This permit is required when a sheet metal worker is manufacturing, fabricating, assembling, handling, erecting, installing, dismantling, alteration and/or repairing duct work, commercial fans, kitchen hoods and vents, architectural sheet metal and metal roofing.